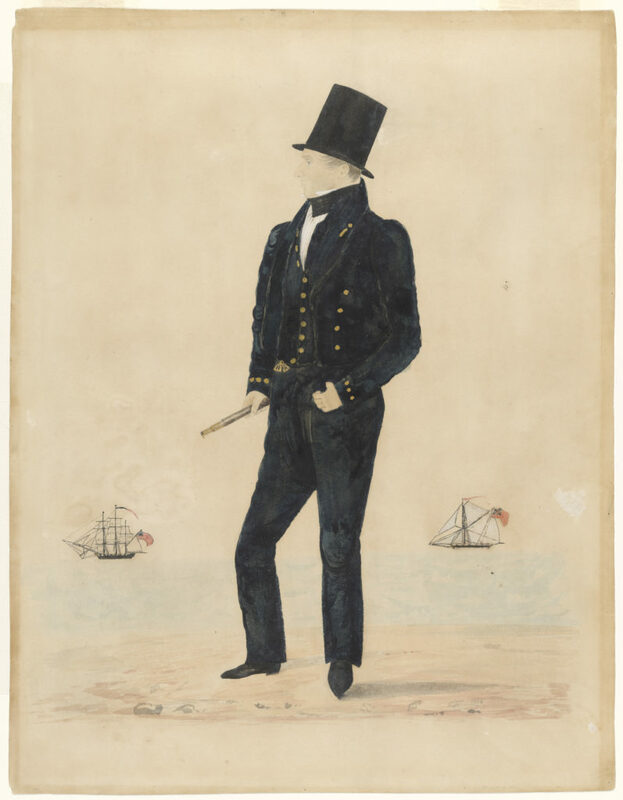 This right facing, full-length profile portrait is painted in watercolour on paper and shows a standing male figure posed on shore, with a pair of mercantile maritime vessels (flying red ensigns) out to sea behind him. He wears a three-piece, single-breasted dark suit (perhaps a type of marine uniform) trimmed at the cuff with gold buttons, also fastening the short jacket and waistcoat, worn over a white linen shirt and a black neckcloth, matching trousers and black leather boots or shoes with pointed toes and a slight heel. The man also wears a narrow brimmed ‘stove-pipe’ style top hat and holds a telescope or spy glass in his left hand. Nothing is known of the subject of this naïvely-drawn profile portrait, beyond an identity (suggested by descendants) of Mr George Prince (1795-1853), eldest son of the late George Prince of Canterbury, Kent, England. It is one of a pair. Black painted ‘profile’ portraits or ‘silhouettes’ were known by various names during the 18th and early 19th centuries; ‘shades’ or ‘shadow portraits’ were the most common terms during the 18th century, with the term ‘profile’ becoming more common by the early 19th century and ‘silhouette’ only in common use in the 1830s. By the late 1820s interest in full length profile portraits, the work of artists known as ‘profilists’, rivalled earlier bust-length versions. This profile form of portrait, sometimes embellished with watercolour details, persisted through the 1840s when the silhouette’s position, as a cheaply available form of rapid portraiture, was threatened by the invention and introduction of photography.